I always freeze lots of blueberries in the summer with the intention of making pies in the winter, but they never last that long. I like snacking on blueberries out of the freezer and I always end up just eating them all. Ha, ha, I buy blueberries to freeze and end up eating them before I can get them into the freezer! Blueberries are just the best. I would love one of these pies. I love any tart in a little size... oh just like your blog name! Your tartlets look very romantic indeed! 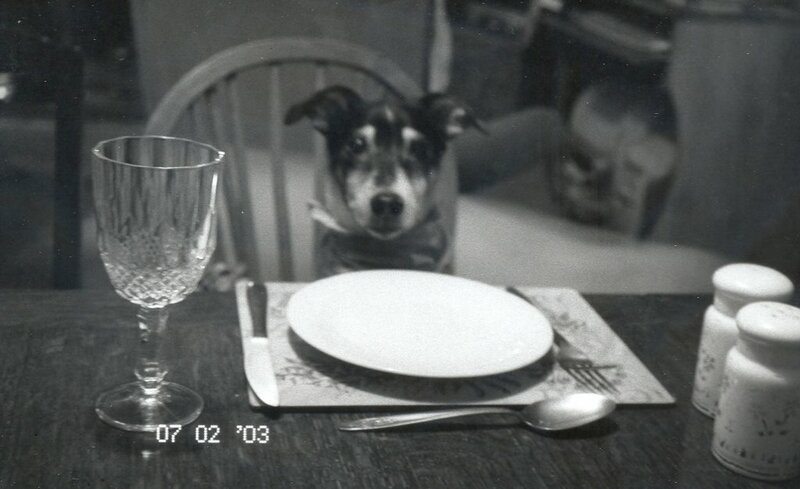 oh now...that's a tart after my own heart. I have a terrible weakness for mini-size desserts. I think its because I think I could have more than one. Your blueberry tarts look so yummy! I think your dad and I would be friends. J'adore aussi la tarte aux myrtilles! delicieuse tarte. So cute! I love miniature desserts, and blueberries are always a favorite too! Hi Helen! Those mini pies are adorable. Blueberry and Lemon are tied as my favourite pies, so I think the touch of citrus in your recipe would certainly make for an indulgent treat! You know how I love all things minature....what a lovely way to say I love you...pie. Helene, these look so beautiful! And the pastry looks perfect too! Miniature anything is just so cute. I'm totally looking forward to berry season. I love blueberries, but have never had them in a pie. If I can bring home a package of blueberries and can manage not to devour them right away, I might have to give these a try! What beautiful little pies - and very appropriate considering the name of your blog ;-) I adore fruit pies and can just imagine how delicious these must be. Thanks for participating in WTSIM! 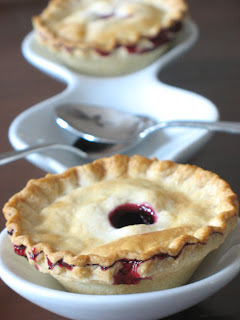 Individual little pies... what a fantastic idea! Very cute...they look delicious. 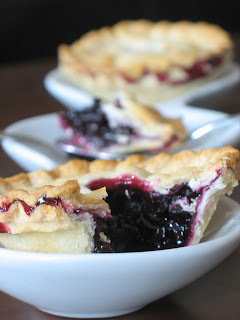 Cherry pie is my favorite, but blueberry comes in a close second... your mini pies look magnifique!! I found this recipe through TasteSpotting.Com and wow was it good. Thank you so much for posting it! - I added 1Tbsp milk and 1/2Tbsp white vinegar to the pie crust, as I find this always make the crust flakier (I also added an extra 1/4 cup flour following this). - Brushed the tops with a mixture made from the leftover egg white, 1Tbsp milk, and 1tsp powdered sugar. Made the finished crust nice and shiny! But yes, recipe was amazing! Once again, thank you for posting: these little beauties have made my day. All you're missing is a scoop of ice cream in the middle bowl! Very funny st. valentine day!